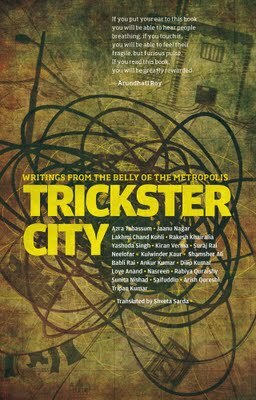 Trickster City is a part fictional, part documentary recount of daily life surrounded by 15 million people in Delhi, India as told from the perspective of a group of twenty somethings. This candid look into life as told by the people who live it makes you inspect each story carefully, looking for clues of whether what you were reading were true or fiction; A testament to the writing is that you could not tell where that line was drawn. 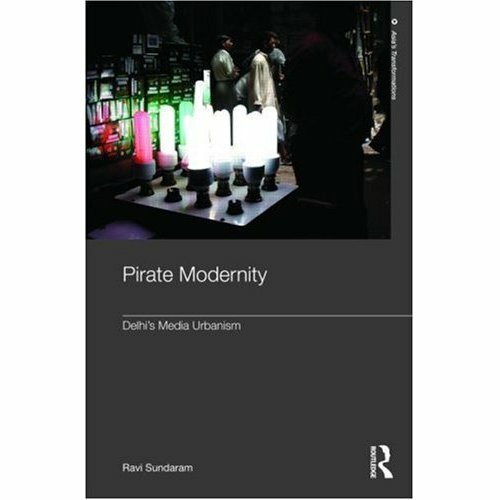 Knowing upfront that this book related to the Sarai lab I was expecting to have learned or read something about new media as it pertains to daily life in India. Unfortunately there was no such trace of this in the book. Instead the stories, fiction or not, painted the picture of a more bleak and disappointing life growing up in the “lanes” of Delhi. The Commonwealth Games which are being held next month were actually the precursor to the demolition of an entire neighborhood where several of the contributors had grown up and lived in all of their lives. This demolition was done in part to clean up Dubai, which is hosting the games. However, the depiction of this devastation as told by the people who experienced it, bore an eerie resemblance to the horror stories of Nazi Germany where Jews were displaced from their homes at a moment’s notice, with nowhere else to go. Released in February of this year, the book, a collection of short stories, was divided into sections: arrival, en route, repartee, whereabouts, eviction, incognito, encounter and frontier. Obviously these sections were divided carefully for a reason. Based on titles alone they portray the rhythm of something less permanent, of someone passing through. As I’m sure they were intended, these sections provide a good framework for understanding the direction of the book, but only until you get more than half way through. My main “technical” criticism of the book is that it’s a bit too presumptuous about its reader’s knowledge of cultural language in India. While an easy read I still had to mentally flag quite a few phrases and words to look up so I could understand their context. I understand that this was likely done in effort to preserve the authenticity of the stories but it often broke my stride in that I couldn’t quite move on from the word(s) that I didn’t understand. Trickster City is an interesting book if you’re looking at Dubai or India for that matter, with fresh eyes. I wouldn’t describe this book as particularly engaging afterall the stories are a guessing game between what’s real and what’s fiction, but it does pull back the curtains for a glimpse inside a sprawling metropolis. Interested in checking it out for yourself? This book is available for purchase here.